2] Fill the 1 ml syringe with 1.00 ml NH3 reagent. 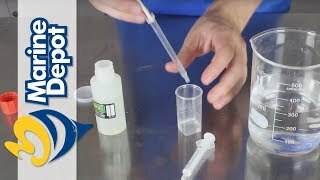 3] Add 0.5 ml to the test vial and swirl gently for 30 seconds. Add the remaining 0.5 ml and swirl gently for 10 seconds. 4] Swirl the test vial gently for 5 seconds. Hold the test vial in front of you and look through the side of the test vial. Keep the color chart behind the test vial. Ensure that a white piece of the color chart is behind the liquid layer. The values on the color chart are in mg/L total ammonia (that is NH3 + NH4+). 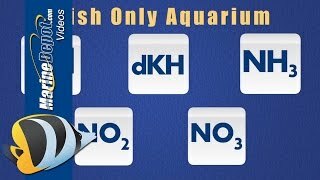 NH3 reagent is irritating and harmful. It contains < 2% NaOH and <0.1% Hg2Cl2 and Hg2I2. S1/2: Keep locked up and out of reach of children. S45: In case of accident or if you feel unwell, seek medical advice immediately. Very easy to use with clear instructions. Typical of Salifert test kits. They are easy to use and give accurate, repeatable results. I also have their Nitrate, Phosphorus, pH, Calcium and Alkalinity test kits. 5 stars to each. I purchased this kit because I suspected my API kit was giving false readings. Using the Salifert kit my ammonia reading was 0 (correct) while the API kit read 1.0! I will not waste my money on API again and will continue to purchase Salifert kits!